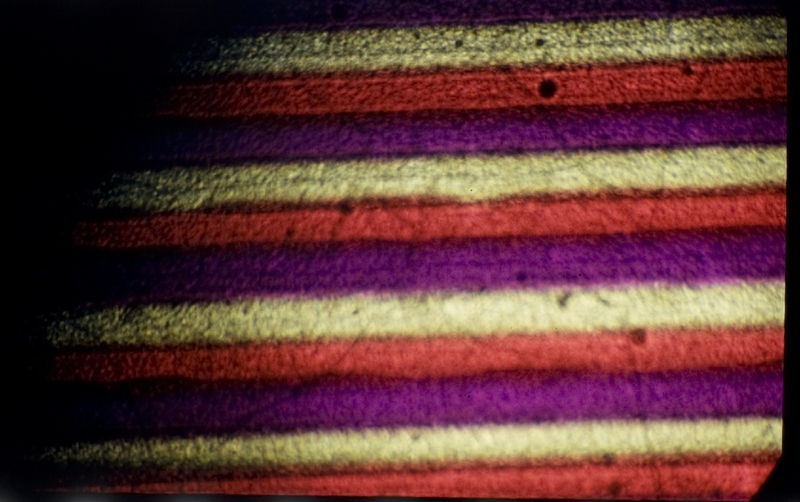 “In 1894 Professor John Joly of Dublin patented a process for producing a screen of red, green and blue-violet lines by ruling them on a gelatin-coated glass plate. Joly used ruling machines of great accuracy, with drawing pens trailed across the plate producing lines less than 1/225 inch (0.1 mm) wide, in contact with each other, but not overlapping. Aniline dyes mixed with gum provided the colour inks. The ruled plates were varnished when they were dry. The screen plate was placed face to face with an orthochromatic plate in a plate holder, with the screen towards the lens. It was necessary to use a yellow filter over the camera lens, to correct the plate’s excessive blue sensitivity. The exposed plate was separated from the screen and developed. A black and white transparency was then made on a suitable plate, and this positive was bound up with another line screen, the two being very carefully registered so that the correct colour element was behind each line of the picture. The Joly process was introduced commercially in 1895, and was the first additive screen-plate process to appear on the market. It remained available for a few years, but the inadequate colour sensitivity of the negative plates then available limited its usefulness. “Joly, in 1896, introduced a modified method in which the screen need not be inseparably associated with the sensitive plate. He used the line screen first described, and in exposing the negative the screen is pressed into close contact with the sensitive surface. 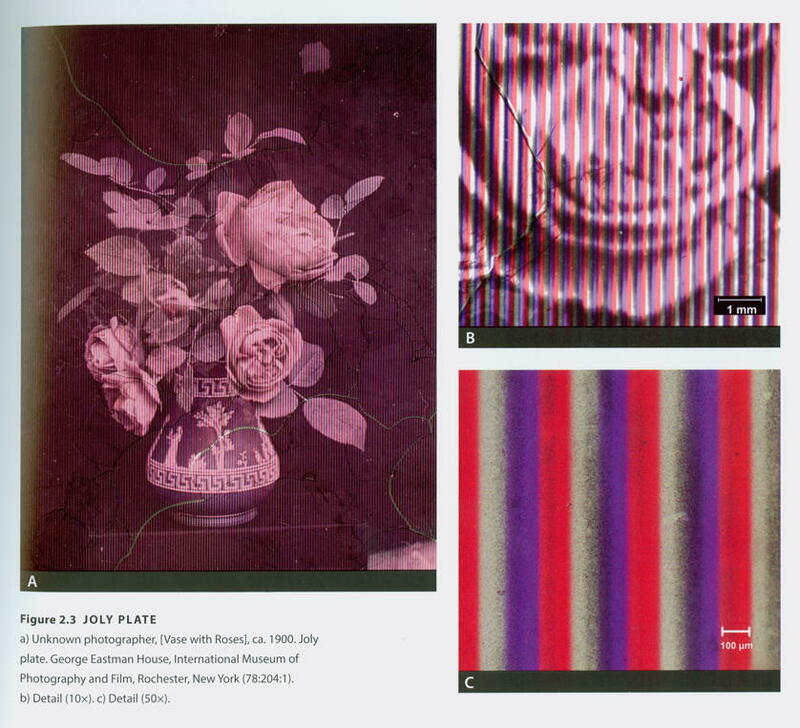 On printing a positive transparency we obtain images of the three colours, corresponding to Clerk-Maxwell’s images, but broken up, and each image is associated with the corresponding colour filter by recombining the screen with the positive, so that the red, green, and blue lines register with the images taken through them. 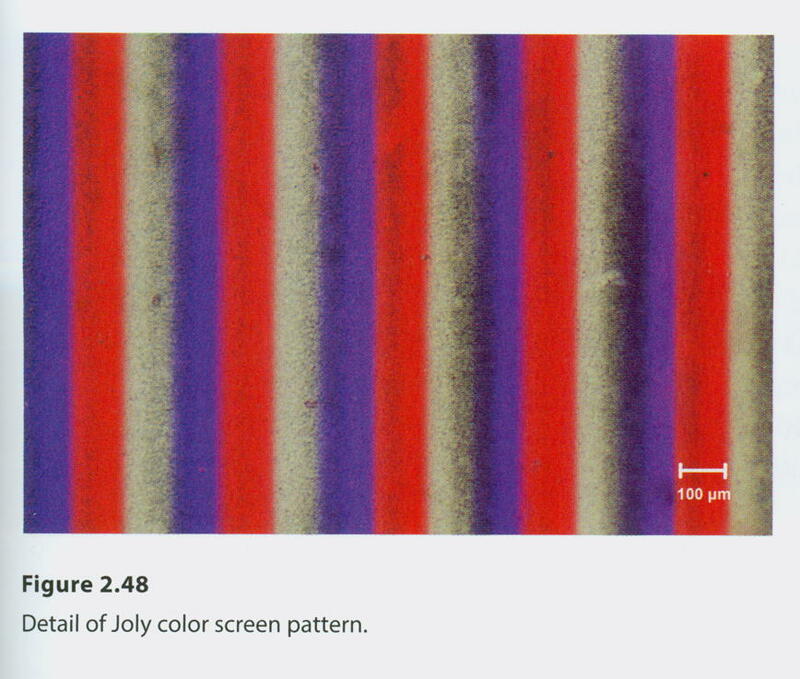 In Ireland, John Joly (1857-1933), of Trinity College, Dublin, developed a color screen made with parallel lines of dyed colloid1 tinted red, green, and blue. These were ruled on a gelatin-coated glass plate by a machine equipped with pens for which Joly obtained a patent in 1894.2 Joly screens were introduced in 1897 by the Natural Colour Photographic Company (Fig. 2.2) and were the first screen plates to reach the market (Anon. 1897). The system used two screens with identical patterns but with slightly different sets of colors: one for capturing the image, the taking screen, and the other, the viewing screen, to view it. The taking screen was lighter in color than the viewing screen, to allow shorter exposure time. It was placed in contact with a panchromatic glass plate negative for exposure in the camera. 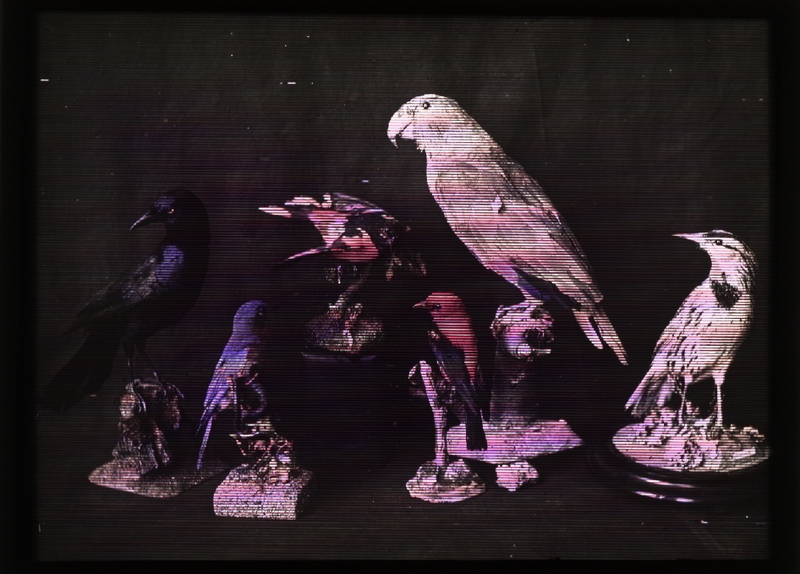 The viewing screen was colored with a set of more saturated narrow-cut dyes.3 It was bound in register with the positive black-and-white transparency printed by contact from the negative obtained in the camera, like a lantern slide. The resulting full-color image could be viewed in transmitted light or projected (Fig. 2.3). “One would hardly have expected good results from such a process, and yet it does give very fair results,” wrote Sir Henry Trueman Wood (1845-1929), secretary of the Society of Arts of Great Britain. 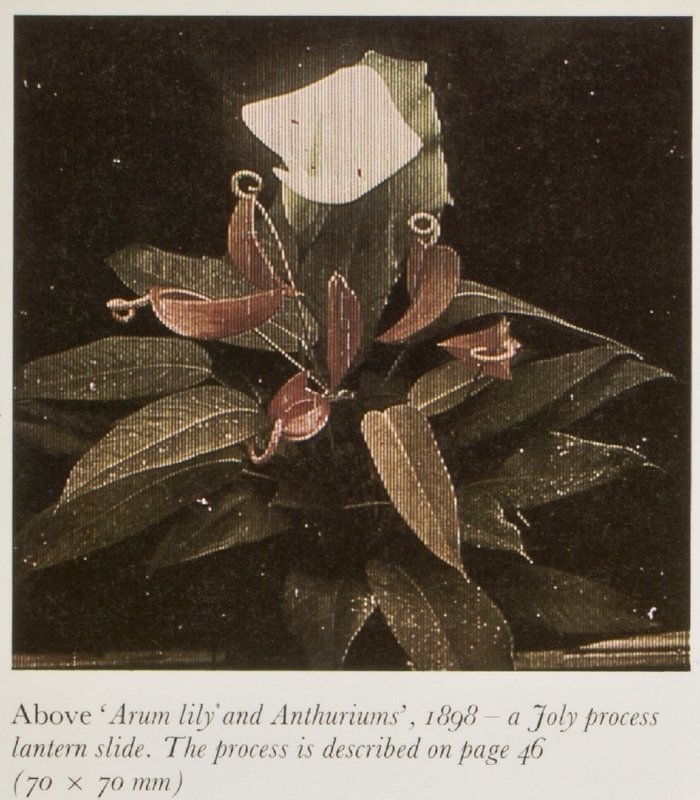 “The effect of colour is well produced, but the picture itself shows the grating, and suggests rather a print from a coarse process block than a direct photograph” (Wood 1897: 282). The system was indeed far from perfect: the lines of the screen were coarse (about 150 to 200 lines per inch) and visible to the naked eye, and panchromatic plates of the time were of inconsistent quality and not very sensitive to red. Moreover, it was difficult to achieve good contact between the two plates in the camera or perfect register for viewing (Mees and Pledge 1910: 198). The material was also expensive: a set of screens and a dozen plates cost almost 5 British pounds (the equivalent of 490 pounds in 2010). Nonetheless, a large number of Joly plates were sold (Eder 1978: 661). They remained commercially available until 1900 (Nadeau 1997: 138). 2 English Patent 14,161 (1894). 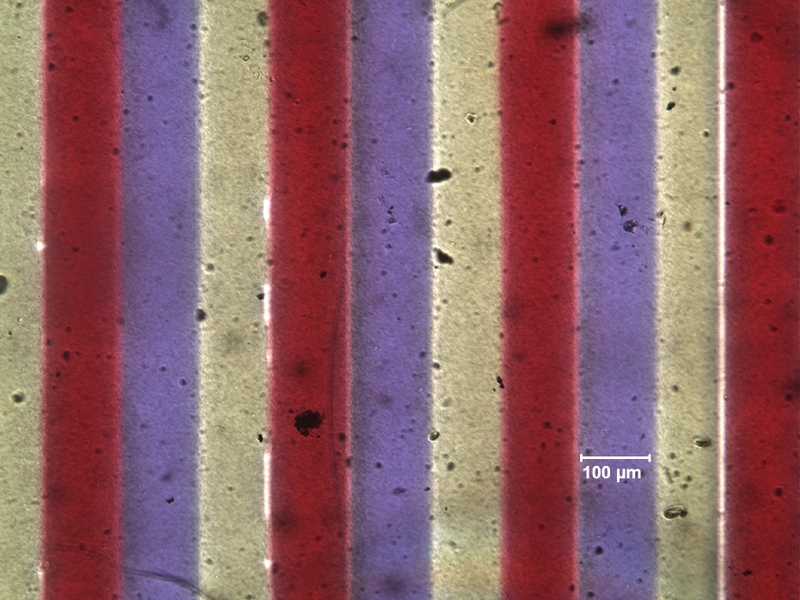 3 The use of such dyes in a taking screen would dramatically reduce its ability to transmit light and result in a great increase of exposure under ordinary light conditions. Anon. 1897. “Photographic Notes.” Pharmaceutical Journal: Weekly Record of Pharmacy and Allied Sciences5 (Nov. 27): 477. Eder, Josef Maria. 1978. History of Photography. Trans. Edward Epstean. Reprint of 1945 ed. New York: Dover. Mees, C. E. Kenneth, and J. H. Pledge. 1910. 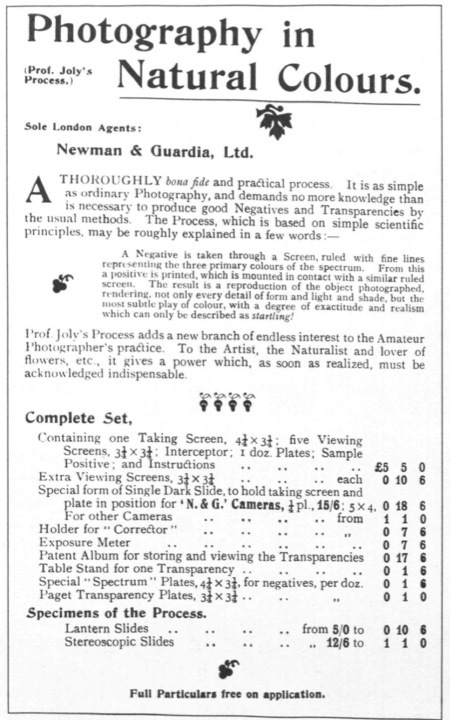 “On Some Experimental Method Employed in the Examination of Screenplates.” Photographic Journal 50 (May): 197–221. Nadeau, Luis. 1997. Encyclopedia of Printing, Photographic, and Photomechanical Processes. 1 vol. ed. New Brunswick, Canada: Atelier Luis Nadeau.